What if you had a safeguard against the ups and downs of an erratic economy? Predictive data can't protect your market investments, but it could help you develop better talent acquisition strategies that work in fair weather or foul. 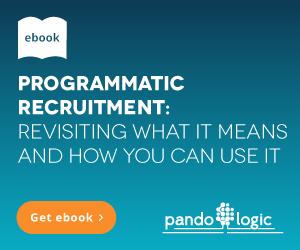 Programmatic and big data holds the answers that you need for smarter and more efficient sourcing. Data analytics organizes that information into meaningful, practical groups. Predictive data helps you use that information to peek into the future with more confidence. The Economy is Growing, but for How Long? Nearly every day, there's another story about the growing American economy. Stocks are always up and down, but for the past year, up has been the trend. Unemployment keeps going down and certain sectors consistently add more jobs. The Bureau of Labor Statistics showed these trends in the October Employment Situation report. Not every sector fared as well, but the overall trends were still positive. And what goes up always comes back down again. Some analysts believe this period of growth is too fast and will create a bubble. The housing bubble triggered the last recession. Some believe that growth is right on track. Either way, the economy is never static. For years, one of the biggest challenges recruiters and HR handled was too many candidates and applicants. Just because you want a talent acquisition funnel that's overflowing with candidates doesn't mean every person who wants a job belongs in your funnel. Then, of course, the tide turned and everyone went back to work again. Instead of too many job seekers, there weren't enough. And along came the rise of data. Sales and marketing were already working with it. These are just a few things that data did and still does for them. Talent acquisition professionals had a new learning curve ahead. Your products are jobs. Your target audience is made up of job candidates. You market to candidates and hopefully sell them on a job when there's a match. Talent professionals are marketing and sales. Big Data helps talent acquisition professionals develop new, more useful best practices that work whether the economy is booming or not. Predictive data uses historical facts as the basis for future decisions. When you know in black and white the conditions that existed when you knocked it out of the park, you're more likely to repeat that success. Data analytics finds those conditions. That's a good thing since most CEOs expect you to know, according to a CareerBuilder survey. Predictive data also helps you spend your budget more wisely and eliminate spending habits that get you nowhere. It helps you determine the best place to spend and where to hold back so your budget spend is scalable but still optimized at every level. When the economy sinks, your budget will probably follow suit. Data shows the most budget-friendly way to hire for the job at hand. It shouldn't be as costly to hire an entry-level worker as it is to hire a manager. Going even deeper, predictive data gives HR talent management insights. When you spot trends early, you can intervene and engage with an employee who, based on the performance of other employees, shows signs of leaving the company. When you weave predictive data into your job, you have a tool that improves everything you do. Big data has the answers that have always been there. If you want a seat at the table, Fast Company says you'll need those answers. Predictive data lets you use those answers to make better decisions in the future. Technolgy can take some of the burdens off your hands by using predictive data to make smarter choices on your behalf. Whether the economy is thriving or in a tailspin, businesses always need to hire. Even when there's no growth, jobs still open up. Best practices aren't designed for the best-case scenario or the worst. They're at a much higher level than that. Best practices are solutions that adapt based on facts, and those facts come from data.